August 13th in Theme Lists, WordPress Themes by Wordpress Jedi . In case you haven’t noticed, there are still plenty of coupon sites available online. The market is quite saturated, but if you love finding and sharing rare coupons with others, you may want to start your own site. Coups is a child theme for Clipper that lets you do just that. It has 10 color schemes and a responsive design. Coups comes with an advanced theme options panel to customize how your site looks. You get 3 slider options, a mega menu system, and coupon countdown functionality. Webmasters have multiple tabs for new, popular, and featured coupons. You can use coupon ribbons to better promote your featured and new coupons. Coups is ready for ads. 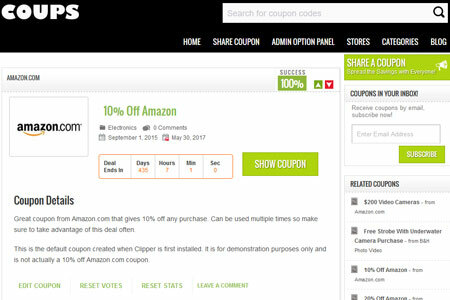 It supports custom thumbnails for each coupon. This is a commercial child theme for Clipper.